Exhibits : 35,000 pieces of traditional Indian crafts from all over the country. The National Handicrafts and Handlooms Museum in New Delhi is one of the largest crafts museums in India. Situated on the Bhairon Road at Pragati Maidan facing the Purana Qila Complex, the Museum contains over 35,000 pieces of traditional Indian crafts from all over the country. Commonly known as Crafts Museum, this charming museum depicts rural life of the typical Indian villages and one can also see craftsmen sitting outside the museum and displaying their skills. It is run by the Ministry of Textiles, Government of India. The museum is situated on the corner of the Pragati Maidan, facing the Purana Qila complex. 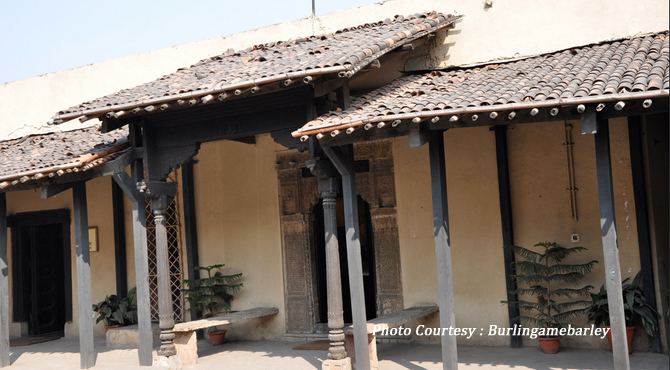 The Crafts Museum was built in 1956 by the efforts of the renowned freedom fighter late Smt Kamaladevi Chattopadhyay. It was then the government exhibited a collection of crafts that was put together by the craftsmen between the 1950s and the 1960s. Today, the museum has transformed into an entire cultural center and a must-see for visitors. The museum houses a range of traditional rare and distinctive pieces that ranges from folk paintings, handmade jewelery, wood carvings, pottery embroidery, tribal textiles, various crafts of clay, stone and wood from different groups and states in the country. These all are housed in a beautiful setting, an exact replica of a typical Indian village, designed between 1975 and 1990 by a renowned architect Charles Correa. The museum, which has been divided into five different galleries namely Bhuta Sculpture Gallery, Tribal and Folk Art, Ritual Craft Gallery, Courtly Craft Gallery and Textile Gallery, today, boasts of a huge collection of tribal and rural textiles and crafts 300years old un, all under one roof thus making Crafts Museum an ideal crafts destination for researchers, designers, students and craftsmen. The folk and tribal gallery has the objects constructed from the materials locally available. The 18th to 20th century objects including terracotta sculptures from Tamil Nadu, bronzes, enamel work, wood paintings and carvings are placed here. It highlights the mythology, ingenuity and whimsy that exists in so much of India's folk art. The upper floor exhibits the best saris and textiles and its embroideries, mirror work and appliques. The museum also features a Village Complex that was built in 1972 and is spread over an area of five acres. Huts made of mud and haystacks, hay roofs that have been made in an untidy manner, pathways that have been created using mud and covered with sand are some of the scenes that greet a visitor when they enter the Crafts Museum. Various craftsmen sitting under these huts showcasing their skills and art work, which are on display and for sale as well further characterizes the very essence of a village life. The rural ambience and the peaceful environs of the museum are both relaxing and rejuvenating at the same time to the museum visitors. The Crafts Museum also houses a Research and Documentation centre that has a collection of more than ten thousand books ranging on topics like Indian Crafts, Arts and Textile Industry, History all under one library, which is open to all for reference and reading. The Crafts Museum also has a gift shop from where one can buy some nice gift items, this shop sells authentic souvenirs and handicrafts that have been made by the skilled craftsmen of the country. The Crafts Museum celebrates various art related events and festivals that tells visitors everything they want to know about that particular art form.